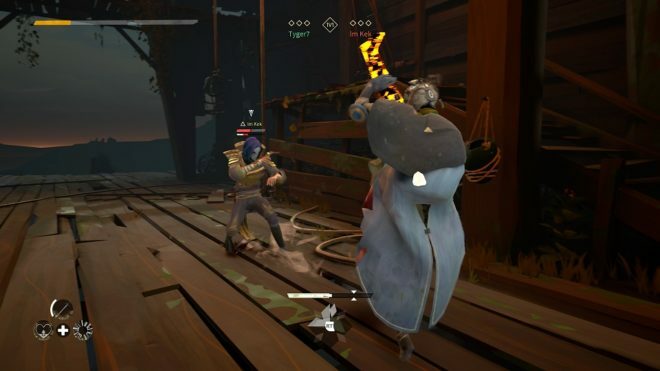 You may ask, what is an absolver? Well, it’s never really covered. You are tasked with becoming one, and maybe it’s just the top tier for a fighter in this world. But where is this world? Also, no one seems to know for sure. There are “lost” prospects, the AI you encounter in your adventure. They attack you on sight. No one ever really dies, they just come back to life. Shrouded in mystery, everyone even wears masks. The entire gameplay is based on martial arts and it’s very PVP oriented. 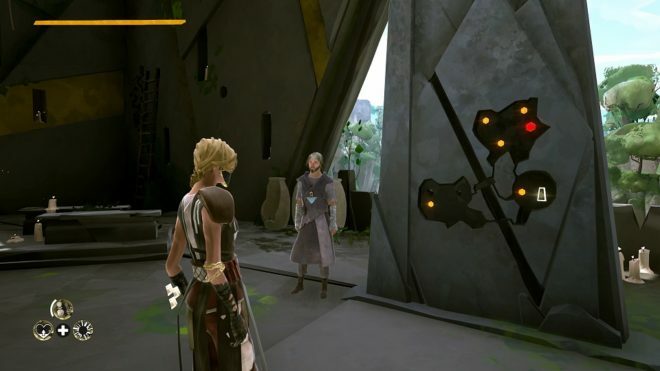 You can play offline if you’d like, but there is not much to do offline besides the short story to becoming an absolver. Open PVP means anyone can fight anyone no matter where they are. The only time they can’t is when you’re meditating. If you die, you lose nothing. So there really isn’t much stopping you from going hostile on people you encounter. 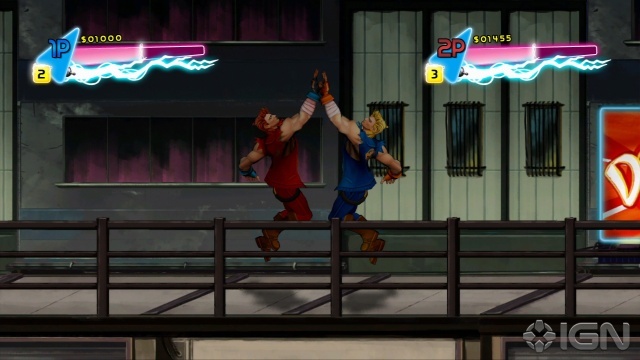 There is a co-op mode as well as multiplayer fighting. Everything is live, so there is no pausing. In a nutshell, it’s a mysterious world where everyone is an exceptional fighter. You can customize your moves and your gear to your playstyle, or just what you think looks awesome. Be prepared, as there is a considerable grind to get the late game equipment. Hand to Hand Combat — I have never been too into the fighting genre, but Absolver takes a different approach. It’s much more personal. You and your opponent generally stay very close to one another. Exchanging hits and blocking, you look for the best moment to strike in order to succeed. There are a lot of moves and you’re able to customize your set. If you go with only heavy attacks, you’ll be too slow. All light attacks, you’ll not be able to break the blocks and won’t be doing much damage. This leads to a bit of strategy if you’re wanting to do some customization. I didn’t bother with it too much, but I like the idea. The martial arts you perform look stylish and, as you get better, you’ll put together some awesome combos. Being the main theme, it is put together nicely. There is “friendly fire” so to speak. If you and your group are ganging up on a poor enemy, you actually have to be strategic. If you both go in swinging, you’ll likely be doing damage to each other. Position yourself at two different angles and as your partner is blocking, go in to attack from behind. I initially didn’t think it was fair to have multiple people attacking at once but, after a few matches, I think they made the right choice with team damage. It allows the solo person to stand a minor chance. You don’t have to be amazing at fighting games in order to enjoy the combat within Absolver. Open PVP and game modes — You can choose to play offline, but what’s the fun in that? Running around the world, you’ll meet other players who can either help you win fights with enemies, or they may turn against you. They can, and will, target you. At first, I was frustrated and annoyed that I was minding my own business, and some jerk comes over and kills me. Now I welcome it. After becoming better at the game, I say bring it on! The satisfaction of making another player respawn after they picked a fight with you is almost magical. Besides that, you can meet some people who will want to team up with you. Maybe you aren’t that good at beating the AI, and they can help and you’ll both get credit. If you want to jump straight into the action, you may also play 1v1 or 3v3. If you’re going solo against someone, victory goes to whoever wins three times first. I enjoyed the matches in which each team had three control points. It is very team-oriented and choices of which points you go after really have an impact on your score. If you don’t like player versus player, you’re able to instead team up in Downfall. This mode pits you into different challenges until you fight a boss. I really enjoy this mode and it’s my favorite thing to do in Absolver. Exploring — The map is basic. It’s on stone with a few lights representing your targets. Only vague clues are given about where to go next. I look at at the map and it doesn’t help me much besides knowing I’m in the wrong area (or, luckily, sometimes the correct one). Even after nearly ten hours of playing, I still had to guess how to get to some areas. Plenty of dead ends haunt your travels as you constantly turn around and try different routes. You cannot jump, so there are no clever short cut opportunities. Fall damage exists to also seemingly thwart your point A to point B mindset. There are plenty of meditation shrines that could have acted as fast travel points. Unfortunately, they don’t act as such, and you’ll be heading to your goals on foot. While doing so I encountered a bit of framerate drop. Sometimes it’s minor, but when it’s constant you have to restrain yourself from force quitting. The world isn’t even that big, it’s just difficult to navigate. A mini-map not being present feels like a major miss, and some people may even give up before getting too far. The Grind — Once you’ve completed the last boss, you can continue to level up and gain more gear. You’ll realize fairly quickly how much you’ll have to play to reach the top levels. There are even items that say you can purchase them at level 2000. Doing my research, this would demand over 600 hours of versus matches. Comparing them to my current gear, they didn’t seem to really be all that epic. They were indeed much cooler looking, but at the cost of the grind, it just doesn’t seem worth it. Even in the first days of release, I struggled to find matches for “Downfall” which is the co-op based mode where you can gain a type of level to unlock more gear. If you have friends to play with then you’ll have no problems, but for those who like to solo queue, it seems you may be waiting a long time. You can replay the bosses at certain intervals of levels and gain better equipment from them as well. But again, you will be forced to play a good amount of matches online in order to reach the availability of them. While I think the system works fine, it seems to take way too long in order to accomplish without gaining much of an award. Not only do you have to unlock the gear through grinding, but then you have to make sure you have enough money to purchase the new loot. All of this seems to lead to more of the same thing. 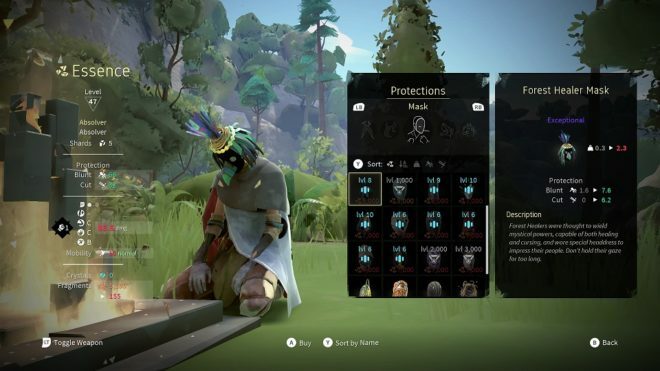 Absolver was published by Devolver Digital and developed by Sloclap on Xbox One. It was released on January 7, 2019, for $29.99.